The Duplessis Orphans (French: les Orphelins de Duplessis) were children victimized in a mid-20th century scheme in which approximately 20,000 orphaned children were falsely certified as mentally ill by the government of the province of Quebec, Canada, and confined to psychiatric institutions. The Catholic Church has denied the allegations, and disputes the claims of those seeking financial recompense. Maurice Duplessis, the premier of Quebec, was a strict Catholic. The Church in Canada, as elsewhere in the world, was inclined to be a caretaker of the poor, alcoholics, unwed mothers, and orphans. He put the schools, orphanages, and hospitals in the hands of religious orders, noting he "trusted them completely". He signed an order-in-council, changing orphanages into hospitals in order to provide them with federal subsidies. Many children were admitted to orphanages because they were abandoned by their parents, not because they were orphans, but often because their parents were unmarried. Children born out of wedlock suffered from poor care. The Quebec government received subsidies from the federal government for building hospitals, but hardly anything for having orphanages. Government contributions were only $1.25 a day for orphans, but $2.75 a day for psychiatric patients, providing a strong financial incentive for reclassification. The Loi sur les Asiles d'aliénés (Lunatic Asylum Act) of 1909 governed mental institution admissions until 1950. The law stated the insane could be committed for three reasons: to care for them, to help them, or as a measure to maintain social order in public and private life. However, the act did not define what a disruption of social order was, leaving the decision to admit patients up to the psychiatrists. The doctors falsely diagnosed the children with various mental illnesses while ignoring their actual mental state. Children in Quebec orphanages were therefore declared "mentally deficient". Schooling stopped, and the orphans became inmates in a mental institution where they were sexually, physically, and mentally abused by lay monitors and nuns. In mid-2016, scientists were able to wrap up a mystery that had been puzzling archaeologists since Howard Carter found King Tutankhamen’s tomb in 1922. 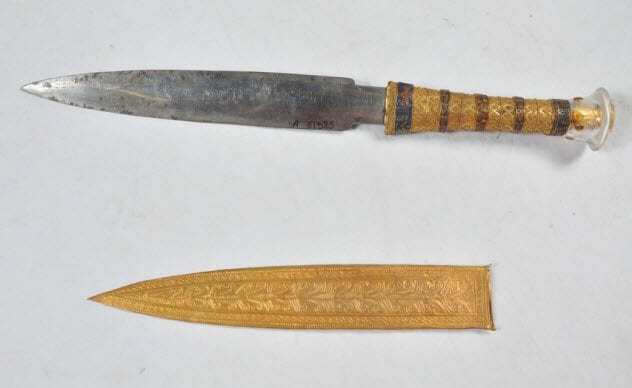 Among the many items buried with the young pharaoh was a dagger made of iron. This was unusual as ironwork in Egypt 3,300 years ago was incredibly rare and the dagger had not rusted. An examination with an X-ray fluorescence spectrometer revealed that the metal used for the dagger was of extraterrestrial origin. The high levels of cobalt and nickel matched that of known meteorites recovered from the Red Sea. Another iron artifact from ancient Egypt was tested in 2013 and was also made using meteorite fragments. Archaeologists suspected this outcome due to ancient texts referencing “iron of the sky.” Now they believe that other items recovered from the pharaoh’s tomb were also made using meteorite iron.